Liverpool hope to appoint Jurgen Klopp to replace sacked manager Brendan Rodgers by the end of the week. German Klopp, 48, is understood to be open to the idea of a move. Talks with his representatives are progressing well and the club want a new manager in place to prepare for a visit to Tottenham on 17 October. In a statement issued by the League Managers' Association on his behalf, Rodgers, 42, said he was "incredibly disappointed" his three-and-a-half-year tenure at Anfield was over. "It has been both an honour and a privilege to manage one of the game's great clubs," said the Northern Irishman, who was sacked after Sunday's 1-1 Merseyside derby draw at Everton. Negotiations will now take place over his severance package, which could cost Liverpool in excess of £5m. Assistant boss Sean O'Driscoll, first team coach Gary McAllister and development coach Pep Lijnders took training for Liverpool's non-international players at the club's Melwood complex on Tuesday. Ex-England Under-19 manager O'Driscoll and former Reds player McAllister joined the coaching staff in the summer. They were part of a backroom reshuffle which saw Rodgers' long-term assistant Colin Pascoe and another former player, Mike Marsh, leave the club. Liverpool's American owners Fenway Sports Group have no plans to travel to the UK and, at this stage, plan to oversee the recruitment process from the United States. Klopp is understood to have spoken to former Liverpool and Germany midfielder Dietmar Hamann about the club, the city and the fans. He has been out of work since leaving Dortmund, with whom he won two German Bundesliga titles, in the summer. Former Germany midfielder Stefan Effenberg believes Klopp will be back coaching "very, very soon" and thinks he is suited to Anfield. Effenberg, who played 35 times for Germany, is a good friend of Klopp and told BBC World Service Sport: "He gave me this answer a couple of weeks ago. He said, 'I'm ready for a team that's not on the highest level, to create something, to build something up'. This could be Liverpool, right?" Speaking at the ASPIRE4SPORT conference in Berlin, he added: "Liverpool is one of the greatest atmospheres. It's pretty much the same as Dortmund. The fans stay with everything behind the club and this is what Jurgen Klopp likes and what he needs. "So maybe, very soon, we'll hear something from Jurgen Klopp, to make a decision, maybe, for Liverpool." 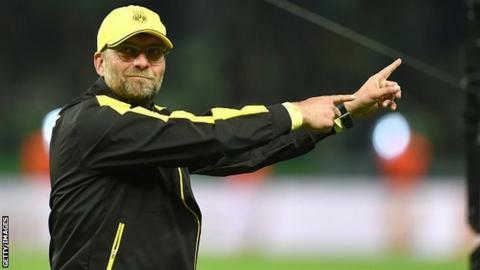 Colin Bell, who worked with Klopp at German club Mainz between 2001 and 2005 told BBC World Service Sport that the "charismatic" 48-year-old "lives his football". "He's not an actor in this sense," said Bell. "He's authentic, he can show his emotions - you can see that on the sidelines when he gets upset with referees or his players. "Klopp has this reputation in Germany as happy and easy to get along with, but he's also a very hard worker on the pitch and if the players do not please him or do not do exactly what he wants them to do then he can get stuck into them which is exactly what players need." Gary Gordon, Dortmund academy coach, described his former boss as a "Mr Motivator" who will "open up some of the players' eyes". He told BBC Radio 5 live: "With a team backing him, I think he'll be able to fix it in a short period of time, at least stabilise the team and be able to play at the level they're supposed to be playing at." "Liverpool need a manager who is big enough to handle the pressure, without thinking he is bigger than the club. "Whoever it is will have to buy into the mindset of the American owners - they want success, but their model is to try to get that by signing younger players they can train up and, sometimes, sell on. "Jurgen Klopp is the favourite to get the job and he would fit the bill. "At Borussia Dortmund he built a team that were in your face, with good players that he was making better but he also knew he would have to sell one or even two every year. Rodgers's replacement, when he is appointed, will work within the existing structure and what has become known as Anfield's 'transfer committee'. It is the group that plots and carries out transfer strategy and up until Sunday night consisted of Rodgers, scouts Dave Fallows and Barry Hunter, the man in charge of analysis Michael Edwards, FSG's Anfield representative Mike Gordon and chief executive Ian Ayre. One of the big reasons for making the change was that owners FSG firmly believe someone else can get better results with the existing players and within that structure. In other words, they believe it is a squad that can and will perform better under someone other than Rodgers. Liverpool have won only four of their 11 games in all competitions this season, including victory on penalties against League Two Carlisle at home in the Capital One Cup. Rodgers, who took over in June 2012, led the Reds to second place in the Premier League in 2013-14. They were top of the table with three games remaining, before losing out to Manchester City. A joint statement from principal owner John W Henry, chairman Tom Werner and president Gordon said: "We would like to place on record our sincere thanks to Brendan Rodgers for the significant contribution he has made to the club and express our gratitude for his hard work and commitment. "All of us have experienced some wonderful moments with Brendan as manager and we are confident he will enjoy a long career in the game. Rodgers said this week that he was "not worried" about the possibility of the sack, despite Liverpool's poor start to the season. After the draw with Everton, he spoke of a "constant rebuilding" job and highlighted the impact of losing "four real catalysts" of his side - Jamie Carragher, Luis Suarez, Raheem Sterling and Steven Gerrard.